Learn what you can do with the Payment Gateway API. The Pay-Per-View API allows you to integrate custom 3rd party Payment solutions. There are a few simple steps that have to be followed in order to integrate and use a custom payment solution with your Pay-Per-View Media. To create your Custom Payment Processor as Pay-Per-View Gateway you will need to go to the ⚙️ Settings tab. Click on the ➕New Custom Gateway in the center column. This will open the Custom Gateway Setup Panel on the right. Here you need to enter a Name for your Custom Payment Gateway. 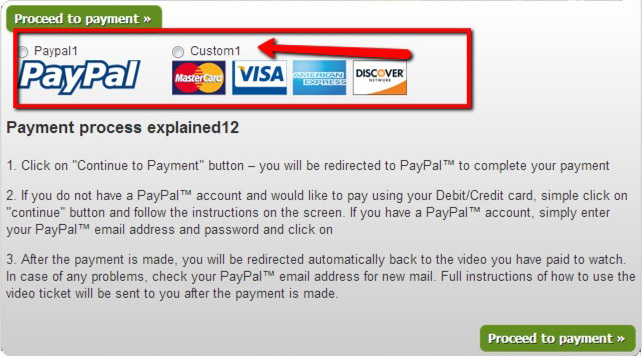 Image: Here you can change the Default Custom payment Gateway Image that is displayed to your viewers by uploading your own one. order_key = Order key generated by our system. This key is required for order confirmation by Developer API. item_name = Name of purchased ticket. This parameter has displaying purpose. amount = Amount of purchased ticket. This is the price that viewer must pay. currency = Currency code of purchased ticket. Format of currency code is referred to ISO 4217 standard. return = After successful completion of order, your viewer must be redirected back to our system via this "return" URL. This should be done after order confirmation through Developer API. Success message will appear and viewer will be able to watch the video. cancel = In case of refusal, viewer must be redirected back to our system via this "cancel" URL. Cancel message will appear and tickets will be shown again. Store input parameters in Session or DataBase in order for them to be available for later use. Complete the payment process with your custom payment solution. Redirect viewer back to our system via "cancel" URL parameter in case of refusal. Redirect viewers back to our system via "return" URL parameter.